Careful medication scrutiny tailored to each patient can potentially reduce the number of medications on patients' lists and foster positive outcomes. 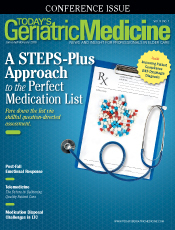 This article provides a comprehensive approach toward achieving a medication list that is optimal both for the patient and for others with a stake in the care of the patient. The frequently used mnemonic STEPS (Safety, Tolerance, Efficacy, Price, Simplicity) is elaborated with the addition of several other parameters. Multiple critical questions for each parameter are posed, forming the details of this scrutiny. The overall approach is labeled STEPS-Plus. Also addressed are implementation and discontinuation of medications when a patient or family disagrees. Application is especially relevant to elders who often have long medication lists, multiple problems, and frequently only a few years of life expectancy. It's no secret that medications can cause side effects and be associated with adverse events, yet they can also improve quality of life and increase a patient's life span. It is imperative to work toward achieving a medication list that is tailored to the individual. The ideal medication regimen is not completely devoid of all potential harm, but instead includes medications whose benefits outweigh their risks. The STEPS analysis (Safety, Tolerance, Efficacy, Price, Simplicity)1 has become a standard approach for assessing specific medications but does not address all variables applicable to a perfect medication list. A more comprehensive, STEPS-Plus critical questions approach is provided here, elaborating on STEPS and adding other parameters. When performing this evaluation, multiple potential interventions to the medication list may result not only in subtractions but also additions, adjustments, and clarifications. 1. Accuracy: Questions asked here are especially important in the outpatient setting or upon hospital admission. Identifying nonprescription and herbal medications is important as many are ineffective, can cause side effects, interact with other medications, and lead to adverse events. In most cases these agents can be discontinued. It is often the case that a provider will need to review multiple medication lists with every office encounter, including medications listed in the office record at the beginning and end of visit, the list provided by the patient, what the patient is actually taking, and any other lists such as those from hospital discharges. Contacting a patient's pharmacy to determine what has been dispensed is often helpful in determining what the patient is actually taking. It is important that the patient leaves the office with an accurate provider-approved medication list. 3. Indication: Not infrequently, a previous legitimate reason for a medication may no longer be active. On the other hand, there may be a compelling indication for a medication not on the list. Consider bisphosphonates in elders, medications recommended for congestive heart failure, and angiotensin converting enzyme (ACE) inhibitors in diabetics. 4. Safety: The number needed to harm conveys the chance of harm or adverse effect from the medication, removing the effect from placebo or other reasons. A five, for example, means one in five or 20% develop the effect from the medication. However, more may experience the harm but not due to the medication. So when deciding to start, stop, or continue a medication, this number needs to be considered. Since common resources usually do not report this number, a general appreciation may suffice or some study will be needed. The Beers list is useful for identifying specific problem medications.2 A useful Beers app is available from The American Geriatric Society for quick determination. The electronic medical record (EMR) may trigger warnings but deciding on the spot how likely an adverse event is to occur is often difficult. The perfect list would include patient awareness and acceptance of safety issues although overnotification may unwisely result in refusal. 5. Tolerance: There may be nuisance or quality-of-life adverse effects that are not appreciated or not worth it to the patient taking the medication. Common symptoms such as aches, lightheadedness, dry mouth, fatigue, and headaches can be easily attributed to other causes when the medication is the culprit. 6. Efficacy: Questions in this category require depth and a critical attitude. Many medications, in turn, can be eliminated based on a patient-specific evaluation of efficacy. Critique must go beyond mere statistical significance and disease-oriented endpoints. The recent relaxation of diabetic A1c goals comes from data showing that just lowering a number does not necessarily benefit the patient. It is important to realize that a number needed to treat of 20, which is generally a good figure, means 95% do not directly benefit from the medication. Furthermore, the magnitude of a likely patient-oriented benefit may not be worth taking the medication. For example, NSAIDs are better than placebo but with only a marginal change in pain score. Alzheimer's disease medications likewise improve outcome scores statistically but minimally with no or marginal patient benefit. • A caution regarding the placebo effect: This side of a medication trial often is more than "nothing" as there was extra attention given and a sense that something was being done. Antidepressant trials have a high placebo response, likely in part for this reason. If a medication with a high placebo response is stopped, it is important to consider what else may be stopped in the process. • A caution regarding futility: Strict futility means the intervention is not meeting nor will it ever meet any goal. Providers are not obligated to prescribe strictly futile medications; however, these situations are infrequent. More often futility is relative, ie, it is not "worth it" to one but may be to another. The worth may even be a false sense of positive effect, but it makes him or her feel better. Granted, this may be a flimsy reason to prescribe a medication, but be cautious not to automatically exclude a medication simply because you, as the provider, believe it is not worth it when a patient/family thinks otherwise. 7. Price: It is important to determine the cost burden to the patient and incorporate this into a shared decision-making process to determine whether the cost is worth it. Cost may result in poor compliance or money may be spent on a medication of marginal value. Providers should be careful not to unilaterally exclude a medication because it "costs society too much." Conflicts of interest may occur, such as being medical director of a nursing home and also the attending for a resident. In this type of situation, it is especially important to apply the answers from all the other questions. 8. Simplicity: This evaluation may trigger discontinuations or modifications. Whenever possible, once-daily medications are preferred. Consider the complexity of administration (eg, inhaled medications). Polypharmacy is complex; the more medications a patient takes, the more likely errors will occur. There may be ways to simplify the medication list without reducing the number of medications. One small study of community-dwelling elders showed 95% experienced one or more practical problems with medication use, including difficulties with instructions, handling the packaging, and taking the medication.3 It is important to help patients figure out how to arrange administration most simply. For example, instructions reading three times a day for one medication and every eight hours for another may result in four or more administrations. Consider also potential difficulties with preparation and administration. Crushing medications and mixing with food takes time. Consider how testing or monitoring may complicate a regimen. Warfarin by itself can be simple but not when adding monitoring, potentially multiple dosage strengths, or differing doses on certain days of the week. 9. Dose: Questions asked here are subsets of efficacy and safety. For example, gabapentin prescribed at low doses when most studies, at least those of postherpetic neuropathy, show benefit only at higher doses; statin doses at lower than current recommendations; and medications that need adjustment in elders even in the absence of renal impairment (eg, citalopram and simvastatin). Maintaining frail elder blood pressures at low although "normal" levels (<130 systolic) with two or more medications is associated with nearly doubling of mortality.4 Short of reducing the medication number, lowering the dose of a medication may be a wise first step. 10. Directions: The perfect list incorporates important advice about precautions and other instructions that may not have been communicated or understood correctly. It is important to ask the patient and caregivers about their understanding of directions. Provider awareness of pharmacy-added directions is also important. Modifications may be prudent when precautions are not very clinically significant. Ensure that the patient knows exactly when to take the medication (eg, every 12 hours may mean exactly that or just sometime in the morning and evening). Some medications, for example, if sedating, are best taken at bedtime. Some are best taken with or without food or with lots of water. Some interact with even small amounts of alcohol, increasing risks of adverse events including nausea and vomiting or dizziness or drowsiness, increasing fall risk. It is important to educate patients on how much alcohol can be consumed, if any. Sun exposure should be limited for some medications. See Table 2 for examples of important directions. 11. Interactions: The number of interaction possibilities is daunting and includes blood concentration changes, magnified side effects, and increased risk of adverse events. QT interval prolongation is a critical concern. Many interactions are not clinically significant; however, deciding when there is a contraindication to using potentially interacting medications can be difficult. The EMR and pharmacy warnings may be overdone; however, an automated warning process is warranted because of the inability to remember every potential interaction. 12. Redundancy: Usually reflects patient confusion and more than one prescriber. Examples include inhalers, proton pump inhibitors, statins, analgesics, pregabalin with gabapentin, and angiotension receptor blockers with ACE inhibitors. Using two antidepressants may be indicated but also may be redundant, deserving reevaluation. 13. Ownership: All involved should assume some responsibility, but it is easy to default to someone else. It is the authors' opinion that the ultimate caretaker of the medication list should be the primary care provider (PCP), serving as the captain of the ship. It is critical to ensure that there is a PCP who takes responsibility. In the absence of such a person (or as one is being recruited), responsibility falls on others. The specialist prescriber shares some responsibility and the pharmacist can be helpful, especially in providing advice regarding side effects, interactions, and administration nuances. The increasing pharmacist involvement in hospitals is an important step toward achieving the perfect list and is routine in nursing homes, although not in adult and assisted living settings, home care, or most physician practices. Furthermore, the perfect list has the patient (or proxy) as co-owner of the list, taking responsibility for maintaining an accurate list and bringing it to all provider encounters, as well as applying personal preference on taking or not taking certain medications. It is important for providers and pharmacists to counsel patients on taking ownership. Consider providing the STEPS-Plus tool as a reference to some patients and proxies who show competency and a willingness to take ownership. The perfect list is one provided to patients at the end of each office encounter and provided to the PCP at the start of the next visit. 14. Conclusions: An action plan should be delineated; this could be something for now or for the future. For billing and problem list notation, there are ICD-10 codes for some "imperfect" lists (eg, polypharmacy, poor adherence, long-term high-risk medications, therapeutic drug monitoring). Table 3 lists several possible subtractions. For many patients, especially those with polypharmacy, achieving a perfect list can be formidable and time-consuming. This tool aims to facilitate the process. It incorporates many of the components of the 10-step "deprescribing" approach of Scott and others;5 however, it goes beyond the single goal of reducing medications by adding other parameters with reorientation into single-word triggers for easier application in real-time encounters. Evidence is limited but growing regarding the impact that a critical and thorough scrutiny of the medication list has on a patient and the potential community benefits. A recent review summarizing the evidence shows a reduced number of medications on patients' lists, as well as some positive clinical outcomes. (This review also describes a modification of the above 10 steps with helpful tips for implementation).6 A recent systematic review of 44 studies of medication therapy management, primarily a pharmacist-based service, graded the evidence as insufficient for health outcome improvement, although it concluded this service may reduce nonadherence and lower costs.7 Despite the lack of strong evidence, it is important that we try our best to achieve a perfect medication list. Special attention should be given to patients with limited life expectancy (when less is usually best) although certain symptom medications may be prescribed more liberally. This applies not only to those with very limited time but also to those with an expectancy of two to three years. When stopping and starting medications, consider informed consent. In a nursing home where a patient may have limited capacity and the proxy is not readily available, it is easy to skip this. This may be reasonable for simple benign changes; however, as a rule, it is wise to obtain informed consent or at least make notification. Reducing the dose as an initial step may be wise and more accepted. Refusal to accept a withdrawal recommendation should be handled with empathetic consideration of the reasons and the futility understandings mentioned previously. When to do a full STEPS-Plus evaluation is unclear. Ideally, a perfect list should be the goal for the end of all routine nursing home progress evaluations, most routine office encounters including wellness exams, and by discharge for hospital patients. It usually will be unrealistic for most acute encounters. The time required will vary depending on the length and content of the list. Familiarity with the categories and questions will make the review second nature, allowing a partial review even during short encounters. In addition, the physician author has incorporated this evaluation into the teaching of residents and students in the primary care office setting, focusing on patients with long lists or limited life expectancy. Feedback has invariably been positive, as it is rare to find a perfect list. A copy of the tool is provided to the learner, noting areas of possible change. Achieving and maintaining a perfect medication list should be a goal of the routine care of all patients. Extra attention is indicated for those with multiple comorbidities, long medication lists, and limited life expectancy. It is anticipated that using the STEPS-Plus approach will aid providers in achieving the perfect list. — James Crosby, MD, is the director of geriatric fellowship at United Health Services in Johnson City, New York, and an assistant professor of family medicine at Upstate Medical University in Syracuse. — Lyndsay Wormuth, PharmD, BCACP, is an ambulatory care clinical pharmacy specialist and a PGY-1 pharmacy residency designee at United Health Services. 1. Shaughnessy AF. STEPS drug updates (editorial). Am Fam Physician. 2013;60(12):2342-2328. 2. Fick D, Semla T, Beizer J, et al. American Geriatrics Society updated Beers Criteria for potentially inappropriate medication use in older adults. J Am Geriatr Soc. 2012;60(4):616-631. 3. Notenboom K, Beers E, van Reit-Nales DA, et al. Practical problems with medication use that older people experience: a qualitative study. J Am Geriatr Soc. 2014;62(12):2339-2344. 4. Benetos A, Labat C, Rossignol P, et al. Treatment with multiple blood pressure medications, achieved blood pressure, and mortality in older nursing home residents: the PARTAGE study. JAMA Intern Med. 2015;175(6):989-995. 5. Scott IA, Gray LC, Martin JH, Mitchell CA. Minimizing inappropriate medication in older populations: a 10-step conceptual framework. Am J Med. 2012;125(6):529-537. 6. Scott IA, Hilmer SN, Reeve E, et al. Reducing inappropriate polypharmacy: the process of deprescribing. JAMA Intern Med. 2015;175(5):827-834. 7. Viswanathan M, Kahwati LC, Golin CE, et al. Medication therapy management interventions in outpatient settings: a systematic review and meta-analysis. JAMA Intern Med. 2015:175(1):76-87.